Today we’re tackling a question that many of us have asked over the years: how do you increase your chances of getting your content into Google News? We’re delighted to welcome renowned SEO specialist Barry Adams to share the framework you need to have in place in order to have a chance of appearing in that much-coveted Google News carousel. Hi, everyone. I’m Barry Adams. I’m a technical SEO consultant at Polemic Digital and a specialist in news SEO. Today we’re going to be talking about how to get into Google News. I get a lot of questions from a lot of people about Google News and specifically how you get a website into Google News, because it’s a really great source of traffic for websites. Once you’re in the Google News Index, you can appear in the top stories carousel in Google search results, and that can send a lot of traffic your way. How do you get into Google News’ manually curated index? So how do you get into Google News? How do you go about getting your website to be a part of Google News’ manual index so that you can get that top stories traffic for yourself? Well, it’s not always as easy as it makes it appear. You have to jump through quite a few hoops before you get into Google News. First of all, you have to have a dedicated news website. You have to keep in mind when you apply to be included in Google News, there’s a team of Googlers who will manually review your website to decide whether or not you’re worthy of being in the News index. That is a manual process, and your website has to be a dedicated news website. I get a lot of questions from people asking if they have a news section or a blog on their site and if that could be included in Google News. The answer tends to be no. Google doesn’t want news websites in there that aren’t entirely about news, that are commercial websites that have a news section. They don’t really want that. They want dedicated news websites, websites whose sole purpose is to provide news and content on specific topics and specific niches. So that’s the first hurdle and probably the most important one. If you can’t clear that hurdle, you shouldn’t even try getting into Google News. 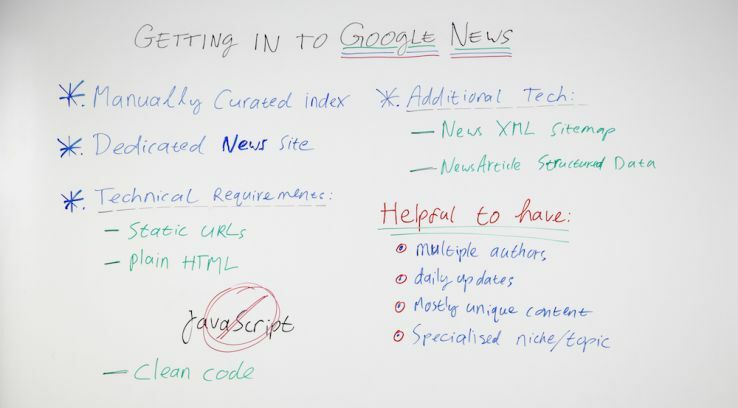 There are also a lot of other aspects that go into Google News. You have to jump through, like I said, quite a few hoops. Some technical requirements are very important to know as well. Google wants your articles and your section pages to have static, unique URLs so that an article or a section is always on the same URL and Google can crawl it and recrawl it on that URL without having to work with any redirects or other things. If you have content with dynamically generated URLs, that does not tend to work with Google News very well. So you have to keep that in mind and make sure that your content, both your articles and your static section pages are on fixed URLs that tend not to change over time. Have your content in plain HTML. It also helps to have clean code. 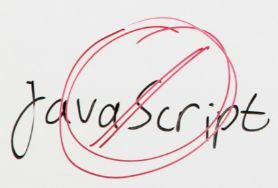 By clean code, I mean that the article content in the HTML source code should be one continuous block of code from the headline all the way to the end. That tends to result in the best and most efficient indexing in Google News, because I’ve seen many examples where websites put things in the middle of the article code, like related articles or video carousels, photo galleries, and that can really mess up how Google News indexes the content. So having clean code and make sure the article code is in one continuous block of easily understood HTML code tends to work the best for Google News. There’s also quite a few other things that are technically optional, but I see them as pretty much mandatory because it really helps with getting your content picked up in Google News very fast and also makes sure you get that top stories carousel position as fast as possible, which is where you will get most of your news traffic from. Have a news-specific XML sitemap. Primarily the news XML sitemap, Google says this is optional but recommended, and I agree with them on that. Having a news-specific XML sitemap that lists articles that you’ve published in the last 48 hours, up to a maximum of 1,000 articles, is absolutely necessary. For me, I think this is Google News’ primary discovery mechanism when they crawl your website and try to find new articles. So that news-specific XML sitemap is absolutely crucial, and you want to make sure you have that in place before you submit your site to Google News. Mark up articles with NewsArticle structured data. I also think it’s very important to mark up your articles with news article structured data. It can be just article structured data or even more specific structured data segments that Google is introducing, like news article analysis and news article opinion for specific types of articles. But article or news article markup on your article pages is pretty much mandatory. I see your likelihood of getting into the top stories carousel much improved if you have that markup implemented on your article pages. Also, like I said, this is a manually curated index. So there are a few extra hoops that you want to jump through to make sure that when a Googler looks at your website and reviews it, it ticks all the boxes and it appears like a trustworthy, genuine news website. Having multiple authors contribute to your website is hugely valuable, hugely important, and it does tend to elevate you above all the other blogs and small sites that are out there and makes it a bit more likely that the Googler reviewing your site will press that Approve button. Having daily updates definitely is necessary. You don’t want just one news post every couple of days. Ideally, multiple new articles every single day that also should be unique. You can have some sort of syndicated content on there, like from feeds, from AP or Reuters or whatever, but the majority of your content needs to be your own unique content. You don’t want to rely too much on syndicated articles to fill your website with news content. Try to write as much unique content as you possibly can. There isn’t really a clear ratio for that. Generally speaking, I recommend my clients to have at least 70% of the content as unique stuff that they write themselves and publish themselves and only 30% maximum syndicated content from external sources. It really helps to have a specialized niche or a specialized topic that you focus on as a news website. There are plenty of news sites out there that are general news and try to do everything, and Google News doesn’t really need many more of those. What Google is interested in is niche websites on specific topics, specific areas that can provide in-depth reporting on those specific industries or topics. So if you have a very niche topic or a niche industry that you cover with your news, it does tend to improve your chances of getting into that News Index and getting that top stories carousel traffic. So that, in a nutshell, is how you get into Google News. It might appear to be quite simple, but, like I said, quite a few hoops for you to jump through, a few technical things you have to implement on your website as well. But if you tick all those boxes, you can get so much traffic from the top stories carousel, and the rest is profit. Thank you very much. This has been my Whiteboard Friday. Optimizing for Google News: A SlideShare presentation from Barry’s talk at Digitalzone 2018 discussing how to optimize websites for visibility in Google News.